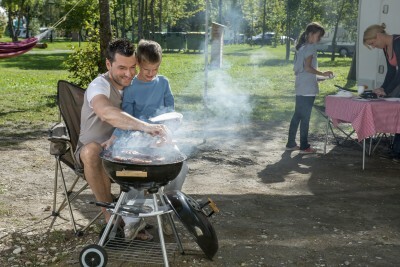 What’s the best thing about caravanning and motorhoming? The results are in! Summer is finally here! If you’re an avid caravanner or motorhomer, June’s glorious sunshine is sure to have you planning your next UK getaway, but if you’re still new to it all or you are considering buying your very first leisure vehicle, the results of our latest poll may interest you. 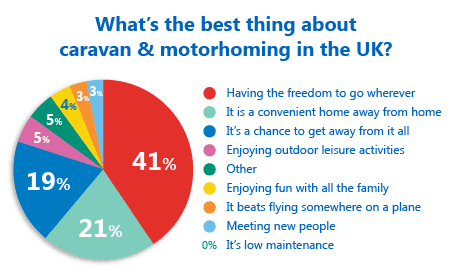 Back in May we asked voters to tell us what they consider the best thing about caravanning and motorhoming in the UK and we’ve been blown away by the response. Well over 400 of you got in touch to have your say on this and despite having nine voting options to choose from, there was one very clear winner. It’s now time to reveal the results! As the chart below shows a huge 41% of you told us that ‘having the freedom to go wherever’ is the very best thing about owning a caravan or motorhome. Meanwhile, 21% of voters told us that being able to make use of a ‘convenient home away from home’ is most rewarding; while a respectable 19% told us that the ‘chance to get away from it all’ gives them the most enjoyment. Outdoor leisure activities were voted in fourth place with 5% of voters choosing this option. Enjoying fun with all the family scored 4% of the final vote followed closely by ‘meeting new people’ and ‘it beats flying somewhere on a plane’ which both scored 3%. We’ll have a new poll for you to get involved with here on the blog next month. We only recently purchased a Caravan, and have been out 3 times, we just love it, go anywhere we like when we like. I often just sit in it outside on the drive and put the Radio on, and I could be anywhere then. Love the opportunity to take my 93 year old mother out for an impromptu picnic. I often love the driving and anticipation of each journey. I often just go and sit in the cab of our campervan and savour the atmosphere. The sense of freedom is just overwhelming without actually even having to go anywhere.